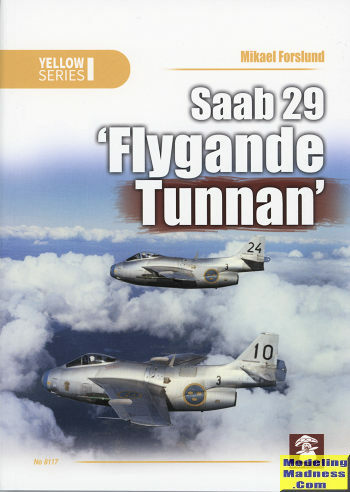 MMP Books » Books » Yellow » Saab 29 "Flygande Tunnan"
The Saab 29, called “Flygande Tunnan” (English: "The flying barrel") was a Swedish fighter designed and manufactured by SAAB in the 1940s. It was Sweden's second turbojet-powered combat aircraft, the first being the Saab 21R; additionally, it was the first Western European fighter to be produced with swept wing after the war, the Me 262 being the first during WWII. Despite its rotund appearance, from which its name derives, the SAAB 29 was a fast and agile aircraft for its era. It served effectively in both fighter and fighter-bomber roles into the 1970s. This book is the most comprehensive on the Tunnan yet published, with numerous photographs of the aircraft in service, several of which have never been published before, walkaround photographs of the preserved aircraft, illustrations from contemporary manuals, and colour artwork. The Saab 29, often called the 'flying barrel' due to its rather rotund shape, was Sweden and indeed, Europe's first production swept wing fighter. Designed with some input from the body of work of German WWII designers, the aircraft was powered by a license built RR Ghost centrifugal flow turbojet engine. Due to the requirements of the engine, the J.29 has a short intake and exhaust. This required a more direct method of feeding the engine with air rather than the usual 'cheek' intakes of other single engine fighters of the time. With this requirement and the need to carry fuel and other military equipment, you get the sort of 'guppy' look of the aircraft. Other neat items used was a nose wheel steering unit, something that was not the norm at the time. The Saab 29 was built in several versions. Most were the J fighter versions, though there were A attack planes and S reconnaissance versions. As with every aircraft the 29 went through a number of upgrades. One was the use of an afterburning engine and another was a 'dogtooth' wing leading edge. The ultimate Saab 29, the J.29F, were all rebuilds of earlier versions, and these were the ones that served in greater numbers and for the longest time. The J.29 had a distinguished combat career as well, operating in the Congo during the early 1960s as part of a UN force that was operating against the breakaway province of Katanga. Though used mostly for ground attack, they did shoot down a plane or two and during the last year of the war, started sporting an interesting camouflage scheme. Interestingly, these were all the initial production J.29A versions as it was felt the oldest versions would be the easiest to maintain. In fact, thanks to a constant supply of spares from home, they were. With the conflict at an end, most of the J.29s were destroyed in country, saving the expense of bringing them back home. In line with other titles in this series we are given the full story of the Saab 29 from its initial development through all the units that flew it even until the present day where one is still flying. A brief introduction and unit usage is followed by a look at all the different variants. This is accompanied by a superb collection of photos, many in color, as well as some great color profiles. Included is a full look at their service in the Austrian Air Force, the only other nation to purchase the J.29. Thanks to the large number of survivors, the details section is quite extensive, providing a look at all the areas of the aircraft, a real plus for modelers. In addition, a full set of 1/72 drawings are included. Review book courtesy of www.casematepublishing.com. You can get yours today from this link. Forslund was born on June 7, 1960 and currently lives in Falun, Sweden. He has worked as a press photographer since 1978 both as a freelancer and as a staff photographer and currently uses Nikon cameras. He has authored over twenty-one books with his latest book on Saab 29 ‘Flygande Tunnan’ that achieved its first flight on September 1, 1948. His other books include Torpedflyget i Sverige (1998), P-35A, AT-12, and P-66 in Swedish Service as J 9, B 6, and J 10 (2008), Gloster Gladiator and Hawker Hart: In Combat with the Swedish Voluntary Wing F19, Finland 1940 (2009), Saab J 21 / J 21R (2010), Glosterflygpan I Svensk Tjanst: Gloster Aircraft in Sweden Service (2012), Caproni Ca 313 R.P.B./S: B 16A - S16 A T 16A - Tp 16A (2012), Swedish Piston Fighter Colours: 1926-1954 (2012), Night Raiders during the Cold War with J 30 and J 33 Mosquito Venom F 1 in Vasteras, looking to the east (2013), Heinkelflüg in Sweden (2014); Spitfire in Sweden (2017) as well as several that are coming out soon: U.S. Military Aircraft in the Royal Swedish Air Force (2017), Saab 29 Flygande Tunnan (2017), Swedish Jet Fighter Colours (2017). You can see more at his web page: http://mikaelforslundproduktion.com/ . Dariusz Karnas is a skilled modeler and amateur aviation historian. He lives in Przemyśl, Poland. He has authored or contributed color plates and/or scale drawings for over one hundred publications. These include MMP’s Polish Wings, Scale Plans, and Inside series as well as books in the MMP Yellow series: Fieseler 156 Storch 1938-1945 (2012) and Mikoyan-Gurevich MiG-15 (2004). You can find Dariusz Karnas on Facebook at https://www.facebook.com/people/Dariusz-Karnas/100008987326348 . The Saab 29, called “Flygande Tunnan” (English: "The flying barrel") was Sweden’s second turbojet-powered fighter designed and manufactured by SAAB. Design work began in 1945 with requirements finalized in October 1945. The 25-degree swept wing was tested on a modified Saab Safir (Saab 201) and the new de Havilland Ghost turbojet engine was selected. To combat the expected high speed, two major innovations were incorporated: 1) Hydraulic servos were implemented to operate the control surfaces throughout the entire flight envelope. 2) An adjustable, movable tailplane was introduced, which is still used in all modern high speed aircraft. Saab J 29 was a fast and agile aircraft, comparable to the North American F-86 and the MiG-15. The Tunnan’s first flight was piloted by a British test pilot on September 1, 1948. Although considered, a two-seat trainer version of the J 29 was not pursued despite a concerning crash record early on during landing. This was due to the lack of experience with a swept wing aircraft and the jump in speed over other types in service. This was resolved with improved training of neophyte pilots, many of which only had a few hours of training in straight-wing jet aircraft before they graduated to the swept wing Tunnan. The Tunnan saw combat service in the Congo from 1961 through 1963 in support of the United Nations with eleven aircraft. These aircraft were the only combat aircraft at the disposal of the UN with most of the missions involving ground attack. Flying low, they encountered significant ground fire, but no aircraft were lost due to combat missions. The J 29 served into the 1970s performing target towing and countermeasures training duties. The last military flight was in August 1976. Twenty-six Saab J 29 Tunnans survive with a J 29F maintained by the Swedish Air Force Historic Flight still flying regularly. This book is a significant improvement over the 1965 Aircraft Profile Number 36 that consisted of 12 pages on the Saab J 29. This to me is easily the most thorough coverage on the Saab J 29 Tunnan yet published. The color walk-around section combined with contemporary illustrations from manuals help expand this detail for the modeler. Thierry Vallet provides well-captioned color side views and color scrap illustrations. Dariusz Karnas provides 3-D drawings in 1/72 scale of the different variations along with cross-sections and scrap drawings. I counted 145 black and white photographs along with 143 color pictures. There were 31 color illustrations and 86 black and white drawings. The tables cover every Saab J 29 produced, denoting the serial number, unit codes, and disposition or other comments. Pilot Replicas produces an accurate and highly detailed 1/48 Saab J 29F injected plastic kit (http://pilot-replicas.com/product/saab-j29f/ ) and an Austrian J 29F variant (http://pilot-replicas.com/product/saab-j29-f-austrian-fliegende-tonne/ ) that basically obsoleted any previous 1/48 kits. If you still have any of the other previous 1/48 kits, they happen to work quite nicely in your shooting clay trap machines. In 1/72, you have the recent Tarangus TA7201 J 29A/B to cover the early versions (pre-saw-tooth wing) and the older Matchbox (Revell) J 29F and Heller (Airfix) J 29E/F (saw-tooth wing) kits. For 1/32 fans you have the vacu-form ID Models kit that was re-released by Tigger Models in 2010 that represents the J 29A/B (pre-saw-tooth wing). Miniwing, out of the Czech Republic, has released a mixed media kit in 1/144 of the J 29B. Mikael Forslund has delivered a great history on the Saab J 29 Tunnan that not only covers the development and operational aspects but provides a good basis for the modeler with nice detail shots of all the aircraft components. Mushroom Model Publications’ has provided a page by page preview at http://mmpbooks.biz/ksiazki/352 . I’ve been a huge fan of Saab (and Swedish) aircraft for most of my life. I grew up to the sound of my dad’s 1959 Saab GT750 and the unique sound it made due to its high output two-stroke engine. I was pleasantly surprised to find a few tidbits that I had heard about in passing but had never really seen photographs of. If you ever thought the Tunnan was a bit funny looking, wait till you see the J 29 that was tested with a radar pod mounted above the intake. I really enjoyed the read and plowed through the 192 pages quickly. United States distribution will be through Casemate. My thanks to Mushroom Model Publications and IPMS/USA for the chance to review this excellent book.